Anne's Food: Home Cook of the year 2011 - win a ticket! Home Cook of the year 2011 - win a ticket! Remember three years ago? 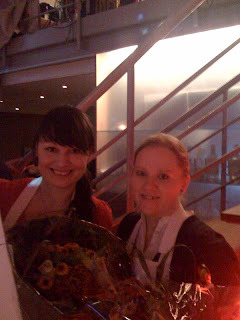 Dagmar, Lena and I won the cooking contest "Home Cook of the Year." It's a really fun contest, and winning was obviously fabulous. It's that time of year agan, Årets Hemmakock 2011, and the contest final is October 19. I'll be there to cheer on the competitors - and you can be too! I have two tickets to give away to one of you - for you and a friend - and if you want to win, send me an e-mail with your favorite recipe inspired by something you had on a holiday. (That happens to be the theme of the contest this year.) It MUST be done in less than 30 minutes! Last day to participate is Sunday, October 9. The finals are in Stockholm, October 19, at 6 pm, so I'm afraid this contest is just open to those of you who can actually attend. You can view the contest recipes here - too bad the food bloggers Tant Russin and Remsan didn't make it to the finals!